We have only very occasionally stayed in nondescript towns with hotels that aspire to mediocrity. Almost all the others have been peopled by the type of folk that only seem to exist in the mid-west, exuding goodwill and kinship. 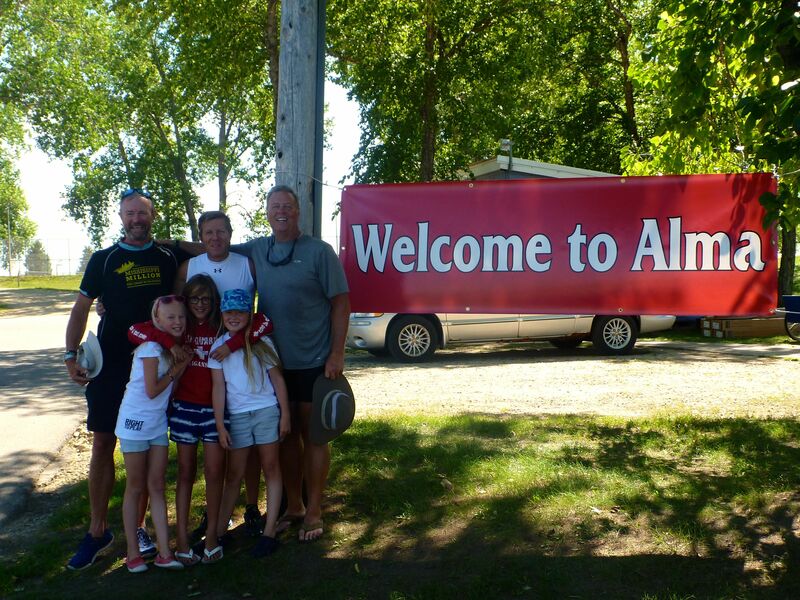 Very occasionally we unearth a diamond in the rough and one such benchmark town is Alma, Wisconsin (pop 782). Located by the banks of the Mississippi, it is full of quaint shops selling river “pearls” (found in clams in the river), fabulously timeless stores selling antiques and curios, but it has one truly stand out location – The Blue Door Inn. It is run by a truly remarkable woman, Kathy Goodman, who has refurbished this very old stone and brick building with impeccaby good taste. It would not look out of place in the French quarter in New Orleans. She has embraced the project, showering us with help, food and an endless stream of local characters from the moment we arrived in the Alma Marina to see a sign saying “Welcome to Alma” placed there just for us. Last night, another local restaurant opened especially for us. Pier 4 smokehouse and barbecue pit was a true wonder, serving us exquisite ribs and pulled pork and corn on the cob of a quality only found in the mid west. The team were agog at the sweetness and staggered to find that it had no additions – just picked and blanched quickly. The Blue Door Inn is a destination hotel – run there and say hi to Kathy. You will not regret it. But we do need to talk about Kevin. Kevin Arnold, who is the clear leading fundraiser thus far on the project, joined us two nights ago and has just finished his second day before heading off with his family. Nothing especially unusual in that – we have had other families with us and others have done similar distances. 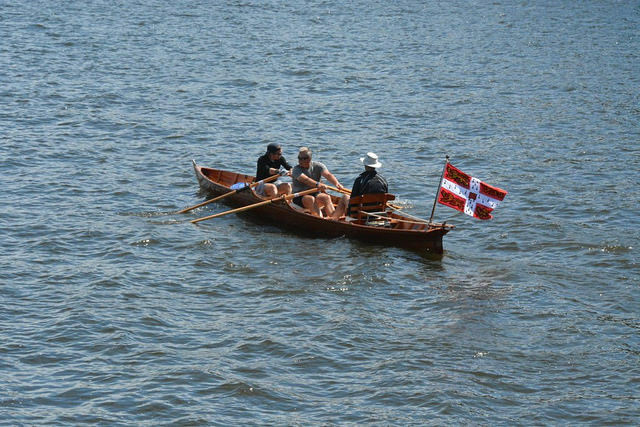 No, what marked this out was that Kevin, bless him, came to do his two days on the back of ONE, yep ONE, rowing lesson. He did apparently try to “train” in the pond in Central Park, edging tourists out of the way, but I am not going to count that. 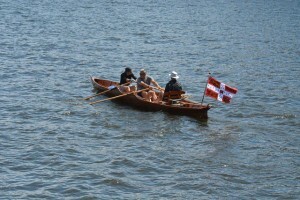 Now, I would be economical with the actuality if I said he was a top class oarsmen after one outing. It would be a stretch to say that he had even mastered the basics when we started. Still, he turned up, fit as a butchers dog, taped up his hands, climbed in the boat and said “let’s go!”. 26 miles yesterday and 28 miles today. Hands bloodied and bottom very sore, but he just kept going, never once complaining even in the teeth of advice from the guys (which he naturally eschewed!). No, ladies and gentlemen, if you need a trooper – someone on whom you can rely to simply tough it out when the odds are stacked against him, call on Kevin Arnold. Everyone who was here with us most certainly will. Tomorrow is just me and Paddy, but the weather is now brewing up to confront us with rain and storm force headwinds. 31 miles into that should give us an appetite…. John and all the group, It truly was a delight and an honor to be a part of your stay. Thank you for the kind words and your good fellowship. If you are ever in this part of the world again, let us know. Smooth and safe rowing! Paul and Marietta. John and the Challenge Crew: You made me blush with all of the praise, thank you! 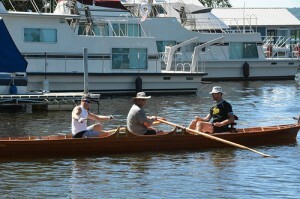 Raining here, hope your day on the River stayed dry until you reached La Crosse. Whatever, whenever, let us know what we can do to continue supporting the efforts of Mississippi Million and the important work of Right To Play. very enjoyable read as always. Did you get a mobile phone yet if so perhaps you will ring us sometime. Betty and I truly emjoyed the night of food & fellowship on Tuesday night in Alma. As pilot of the Misissippi River Parkway Commision I hope you will be welcomed by others of the Commission as you move down the river. Safe journey!